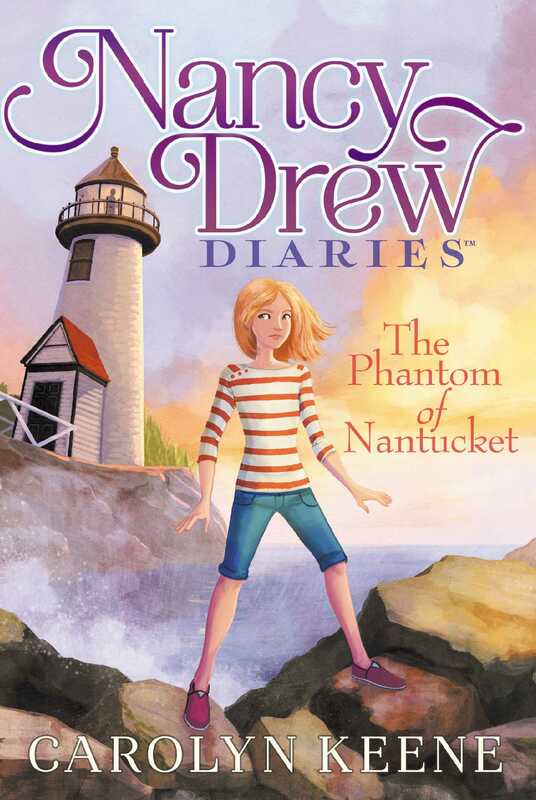 A dream trip to Nantucket turns into a nightmare in this seventh book of the Nancy Drew Diaries, a fresh approach to a classic series. Nancy, Bess, and George can't wait to start their trip to Nantucket. The three girls are there to visit Bess’s family friend Jenna and go to the opening of an exhibit at the local whaling museum. Jenna’s been working on the exhibit for months, but when the girls get to the museum, a threatening banner has replaced the welcome sign. Nancy’s got plenty of potential suspects, but she’s worried she won’t be able to solve the case in time to save the opening. And as the threats increase in severity, she becomes more concerned about Jenna’s safety than the ruined exhibit. Can Nancy find the culprit in time? “LAND HO!” MY FRIEND GEORGE CALLED, waking me from my nap. It took me a second to recall where I was, but I grinned as soon as I remembered. I was on a ferryboat headed toward Nantucket Island for a Labor Day weekend of beaches, ice cream, and museums. It had been a busy summer of work and family obligations, and I was looking forward to some time off before the fall. I sat up straight and looked at where George was pointing. Through the fog, I could just make out the edge of the shoreline and a lighthouse standing tall above the rocks. Painted in bright red-and-white stripes with a glass top that allowed the light to shine through, warning arriving boats of the rocks, it looked exactly how I had hoped it would. “It’s just like a postcard!” I exclaimed. I put away the book I had been reading before I drifted off. “We’d better wake Bess. You know she’ll want to put herself together,” George said, rolling her eyes. My best friends Bess Marvin and George Fayne are cousins, but you’d never guess it. They’re about as opposite as you can get. Bess isn’t a girly-girl, but she likes to wear nice clothes and her hair is always perfectly styled. For this trip, she was wearing seersucker pants, a pink collared shirt, and a yellow V-neck sweater. She fit in seamlessly with the other tourists on the ferry. George, on the other hand, keeps her hair short so she doesn’t have to think about it and wears jeans and sneakers every day. I’m more in the middle. I’m not the fashionista that Bess is, but I like to look nice. I guess that’s why the three of us are best friends. We all fit together, and we each have our own place. I shook Bess’s shoulder gently, and she woke with a start. “What’s happening?” she asked through a yawn. “We’re almost there,” I told her. I knew what she meant. It had been a long trip. We’d left our hometown of River Heights at seven a.m., and now it was almost five p.m. When Bess’s mom’s oldest friend had invited us all here for the opening of her daughter Jenna’s exhibit at the local nautical museum, I hadn’t realized just what a journey it would be to get to Nantucket. “Maybe Jenna will have bikes we can ride to get that number up to five,” I joked. Bess wrinkled her nose. “I don’t think Jenna’s the type to ride bikes.” She offered George her hairbrush. “Why not?” George asked, declining the brush. I took it instead. We could hear the engines of the ferry slowing. People around us started to get up. “She sounds intense,” I noted. “Ladies and gentlemen, we are docking. We will be disembarking from the starboard side of the ship,” boomed a voice from the loudspeaker. George, Bess, and I exchanged looks. We weren’t quite sure which direction starboard was, but everyone around us was headed toward the right side of the ferry, so we followed them. George lagged behind us, lugging her gigantic backpack. She practically staggered as she adjusted to its weight. “I still don’t understand why you felt the need to bring so many electronics with you,” Bess commented. “What else are you supposed to do on vacation?” George asked. Bess shook her head as she held open the door to the outer deck of the boat. From here we could see people gathering on the dock, waving to the ferry. Walking to the side, Bess peered into the crowd, looking for Jenna. “There she is!” Bess shouted, waving. “Which one is she?” I asked. “Come on, Detective Drew, you can figure it out,” Bess joked. My friends like to tease me because in our hometown of River Heights I’m something of an amateur sleuth. A while ago I discovered that I was pretty good at solving mysteries, and now people ask me to help them if they think someone is stealing from their business or cheating in a competition . . . things like that. I scanned the crowd, searching the sea of pastel polo shirts until I saw a serious-looking young woman in a Nantucket ­Nautical Museum sweatshirt standing with perfect posture, her long brown hair tied back into a tight ponytail. “I see her!” I exclaimed, pointing. “You solved the case!” Bess laughed. “I wish they were all that easy,” I joked back, as we walked down the ramp off the boat. I glanced at George. It was unusual for her to be quiet for this long. She was staring down at Jenna, looking slightly nervous. George is always so confident and tough; it hadn’t occurred to me that she might be anxious about fitting in with Jenna. Bess and Jenna had known each other their entire lives—their moms had been friends since childhood—but Jenna’s family lived several states away from us. Still, Bess’s and Jenna’s families saw each other every year; they even had a tradition of going skiing together. George and I had heard stories about Jenna for years, but neither of us had ever met her. Originally, Bess’s mom had said that my boyfriend, Ned, could come with us to Nantucket, but George had asked me whether it was okay if it was just the three of us. She didn’t want to feel like a third wheel with Ned and me and Bess and Jenna. I would have said yes no matter what, but it worked out perfectly, since Ned’s family always took their annual camping trip over Labor Day weekend. “Hello, Bess.” Jenna greeted Bess with a stiff hug. I noticed the baggage cart making its way down the ramp with our luggage. We followed Jenna as she led us to where it would stop. Jenna trailed off, and I couldn’t help but wonder what she was going to say. That’s one problem with being a detective: You can’t stand unanswered questions. “What makes the reception so critical?” I asked. “Mr. Whitestone, the president of the museum’s board of trustees, is coming. If he’s impressed by the turnout and the exhibit, Pete says there’s a really good chance he’ll offer me a permanent position.” Despite herself, Jenna broke out into a big smile. “Yeah, but it will. I mean, I know you; you’ve probably checked everything a hundred times already,” Bess said. We followed Jenna out of the parking lot around the ferry dock, past a row of seafood restaurants, ice-cream parlors, and T-shirt shops. The streets were made of cobblestone and the sidewalks, paved in red brick. “Is this why people call Nantucket the Little Gray Lady?” I asked Jenna as we passed a row of gray-­shingled buildings. “It’s actually because of all the fog, but your reasoning also works,” Jenna said with a laugh. The late-afternoon sun made the whole place aglow with a magical light. With the narrow streets and weathered buildings, there was a real sense that you were walking the same streets that people had walked two hundred years ago. Down the street, a woman who looked to be about Jenna’s age walked toward us, pushing a man in a wheelchair. Jenna’s face lit up in a big smile, and she waved. The woman stopped, and Jenna introduced us. “This is Marni, my best friend on Nantucket, and this is her grandfather, Mr. Fraiser,” Jenna told us. We all shook hands. “Mr. Fraiser is my favorite person on the island. Can you guess why?” Jenna asked. “Because he’s the oldest person on the island?” George asked, half under her breath. “George!” Bess hissed, hitting her. My jaw dropped. I couldn’t help it. I’d never met anyone over ninety before. Mr. Fraiser nodded, but he seemed to be thinking about something else. I couldn’t blame him. He was 104. He’d earned the right to think about whatever he wanted. “We have to head home,” Marni said. A disappointed look flitted across Jenna’s face. “You do?” she asked, confused. “Sure,” Jenna said. Marni headed off, pushing her grandfather. “I don’t envy her having to push that wheelchair on these cobblestones,” I observed. Marni seemed out of breath after only a few steps. “She’s used to it,” Jenna said. We walked quickly, and after two blocks, Jenna stopped us. “Here we are,” she said. We were standing in front of a large brick building. A mural depicting a boat chasing a whale with a harpooner at the ready was on one of the outside walls. It was captioned Going on the Whale. Leaning out of a window near the top of the building was a kind-­looking middle-aged man hanging a banner. “You know I wouldn’t miss this, Pete!” Jenna yelled back. Out of the corner of my eye, I saw a guy leaning on the corner of a building, watching Pete hang the banner. The guy kept checking his phone and seemed fidgety. “Does he look like he’s up to something?” I asked Bess, nodding toward the guy. I knew she was right. I was making something into a big deal when nothing had even happened. My brain just wasn’t used to not having a case to solve. That man was probably waiting for his date to arrive or something. Pete looked down at Jenna from the window and gave her a thumbs-up. “Just a few more seconds,” he shouted. It took all my willpower not to turn and see how Mr. Fidgety reacted to this news, but I could feel Bess’s eyes on me, and I wanted to prove to her that I could be on a real vacation—detective work not included. “You ready?” Pete shouted at Jenna. “Of course!” Bess said, getting herself into position. He unfurled the banner. It dropped down the side of the building, billowing with a satisfying whoosh. When it finally fell into place, a gasp went through the crowd that had gathered outside the museum. The banner advertised MYSTERY OF THE ELEANORE SHARPE SOLVED! But written across it in bright-red letters was the word LIAR!